Giving praise and thanks to our Great God and Savior Jesus Christ, using the Word of God, is spiritually exhilarating. This is one prayer that I wrote, praying the Word. Use it, or better yet, write your own praise and thanks prayer based on verses from the Bible. Our Father, which art in heaven, we hallow Your name. We pray that thy kingdom come and thy will be done, as in heaven, so in earth (Luke 11:2). You are worthy, Jesus, to receive glory and honour and power for You created all things, and for Your pleasure they are and were created (Rev 4:11). 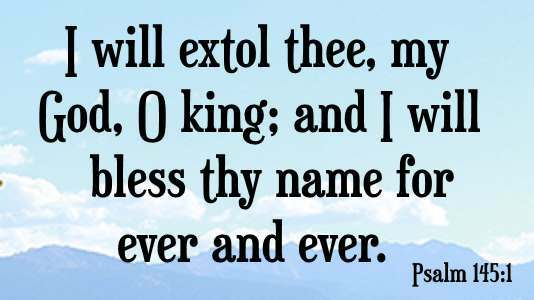 We extol thee, our God, our King; and we will bless Your name forever and ever (Psalm 145.1). We exalt and worship You, Holy God (Psalm 99:9). And in this day we say, Praise the LORD, and we call upon Your name declaring all You do for us, always exalting Your name (Isa 12:4). In the beginning was the Word, and the Word was with God, and the Word was God (John 1:1), and the Word was made flesh, and dwelt among us, (John 1:14). We thank You mighty God for manifesting Yourself in the flesh, being justified in the Spirit, seen of angels, preached unto the Gentiles, believed on in the world and received up into glory (1 Tim 3:16). Hallelujah, in You Lord dwells the fullness of the Godhead (Col 2:9). We know that there is One Lord, one faith, one baptism (Eph 4:5); and that there are three that bear record in heaven, the Father, the Word, and the Holy Ghost, and that these three are one (1 John 5:7). They are You Lord Jesus, Son of God (1 John 5:20). We know that You are the way, the truth, and the life and that no man comes to the Father, but by You (John 14:6). Jehovah, we praise and thank You for becoming our salvation (Isa 12:2). We praise and thank You Jesus for dying on the cross for our sins, being buried, rising from the dead, giving us the gospel to obey (1 Cor 15:1-4). We praise and thank You for Your suffering. When the multitude cried out "let His blood be on us, and on our children" (Matt 27:25), we know they represented all of humanity because You drank that cup for all of us (Luke 22:42). Figuratively, we spat on You, we slapped You, beat You with our fists (Matt 26:67), plucked Your beard (Isa 50:6), pounded thorns into Your skull (Mark 15:17,19), flogged You with a cat-o-nine tails until Your backside was raw (Mark 15:15), made You carry the cross on Your raw back to Golgotha (John 19:17) and we held that hammer driving the nails through Your hands and Your feet, crucifying You there (John 19:18). We mocked You (Luke 23:36), divided Your clothes (John 19:23), cast lots for Your coat (John 19:24) and pierced Your side with a spear (John 19:34). And what did You do? In Your humanity, You asked Your divinity to forgive us (Luke 23:34), which we know You do when You forgive our sins when we are baptized in Jesus' name (Acts 2:38 ESV). 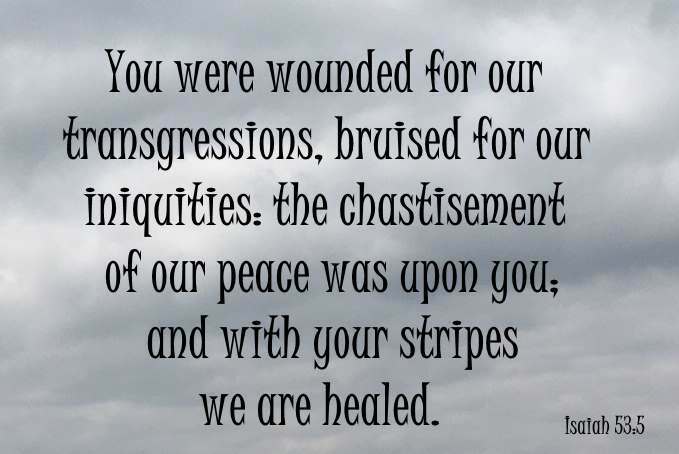 You were wounded for our transgressions, bruised for our iniquities: the chastisement of our peace was upon You; and with Your stripes we are healed (Isaiah 53:5). Jesus, we lift up our eyes to where our help comes from - to You Lord who made heaven and earth (Psalm 121:1,2). For Lord we know Your unfailing love is as vast as the heavens and that Your faithfulness reaches beyond the clouds (Psalm 36:5 NLT). We will bless You Lord at all times, Your praise shall continually be in our mouths (Psalm 34:1). We give thanks to You in all circumstances, both good and bad, for we know this is the will of God in You for us (1 Thess 5:18). For God hath not given us the spirit of fear; but of power, and of love, and of a sound mind (2 Tim 1:7 ). We praise and thank You for the Comforter, which is the Holy Ghost, whom the Father sends in Your name (John 14:26). We thank You for allowing us to know the truth – that the Holy Ghost is the mystery which hath been hid from ages and from generations, but now is made manifest to all of Your saints (Col 1:26) which is to know the riches of the glory of this mystery among the Gentiles; which is Christ in us, the hope of glory (Col 1:27). Lord Jesus, You are the KING OF KINGS, AND LORD OF LORDS (Rev 19:16), the God of Israel (Matt 15:31), the Lord of Hosts (Isa 44:6) and the King of glory (Psalm 24:10). You are the High Priest (Heb 3:1), the most high God (Acts 16:17), the Alpha and Omega, the first and the last (Rev 1:11) the beginning and the ending, the which is, and which was, and which is to come and the Almighty (Rev 1:8). Christ Jesus, You are Lord Jehovah (Isa 12:2), Messiah (John 1:41), Yahweh (Psalm 118:14), Elohim (John 1:1,14), El Shadia (Rev 1:8), the great Rapha – our healing God (Ex 15:26), the true Nissi – our leader - our banner that goes before us (Ex17:15), Jehovah Jireh - our Provider (Gen 22:8,14), Jehovah Raja – the Lord is our Shepherd who watches over us (Psalm 23:1-6), and Jehovah Shalom – our peace (Judges 6:24). You are our joy (Rom 5:11), our love (John 8:42), and our everything (1 Cor 1:5). You are Wonderful, Counselor, the mighty God, the everlasting Father, the Prince of Peace (Isa 9:6), our blessed Redeemer (Luke 1:68), the Holy One (Mark 1:24), our Savior (John 4:42), the living Word (John 1:1,14), our loving Friend (John 15:14), our precious Brother (Matt 12:50), our good Master (Mark 10:17), our heavenly Father (Luke 11:13) and the rock of our salvation (Psalm 89:26). Yes Jesus, You are our rock and our fortress, our deliverer, our strength, our buckler, our high tower and the horn of our salvation (Psalm 18:2), and our strong tower that we run into to be safe (Prov 18:10). You are our daddy - Abba Father (Gal 4:6), Emmanuel – God with us (Matt 1:23), God in us (1 John 4:12), the heart knower (Rom 8:27), the only salvation (Acts 4:12), the bright and morning star (Rev 22:16), the rose of Sharon and the lily of the valleys (Song 2:1). You are the I AM THAT I AM (Exodus 3:14), the Holy One and the Just (Acts 3:14), the creator of Israel and our King (Isaiah 43:15), and Holy, Holy, Holy Lord God Almighty (Rev 4:8). Blessed is the King of Israel that comes in the name of the Lord, Hosanna in the highest (John 12:13). Christ Jesus, our Lord and our God (John 20:28), You are the same yesterday and today and You will be for ever (Heb 13:8). 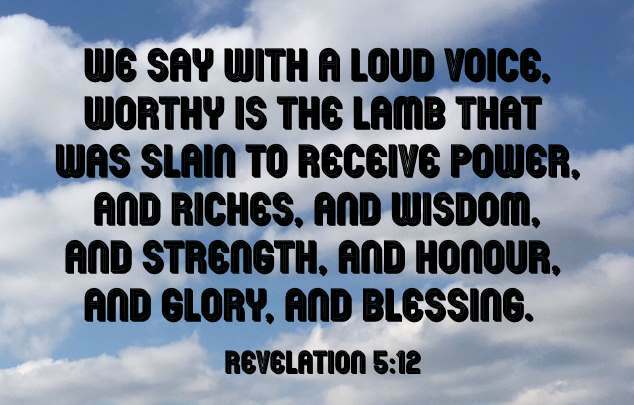 We say with a loud voice, worthy is the Lamb that was slain to receive power, and riches, and wisdom, and strength, and honour, and glory, and blessing (Rev 5:12). Blessing, and honour, and glory, and power, be unto Him that sitteth upon the throne, and unto the Lamb for ever and ever (Rev 5:13). In Jesus' name, we praise and thank you Savior.